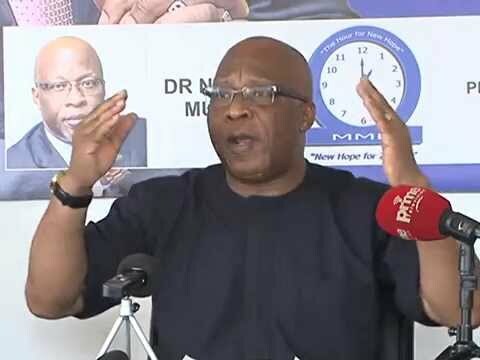 MMD leader Nevers Mumba says reports that he is looking for a job in the PF government are false, adding that he cannot work for a President whom he does not recognise as legitimately elected into office. And Mumba has appealed to all MMD members who left the former ruling party to apply for readmission before the next convention. Mumba said this when he featured on a Pan-A frican radio programme today. “Ba Lungu even if he stays for five years in office, he goes down in the history as a President who stole an election, and he will be called a thief for that. If I were his friend I would tell him ‘regularise your presidency, legitimise your presidency’. I haven’t been speaking to President Lungu but you are saying that am looking for a job, which job? How can I look for a job in a government that is soon to collapse because of the corruption that its engulfed with? I don’t think it will last,” Mumba said. Mumba said President Lungu’s failure to fight corruption would destroy his legacy. “If President Lungu doesn’t effectively tackle corruption, every little effort that he has made will be destroyed. There is no president that has been close to corruption who has made it in the following election. president Rupiah Banda was moving economically, but when the election came, he could not be re-elected. So even Mr Lungu, he can be protected by Mr Governor, but I am more useful to President Lungu, I am more of a friend to President Lungu, I am more of a comrade to Mr Lungu than the Governor. The Governor is trying to allow Mr Lungu not to see what the country is saying about him. I am telling him ‘my brother you can change this. The only way to change is for you to rise up, face the nation’,” Mumba said. He said PF members were trading on thin ground by acting above the law. “This government thinks they are above the law, they can do what they want without being questioned. I tell you what, they are trading on dangerous grounds. We have all been in government, I can tell you the temptation of being arrogant. The moment you discern from that position, you will regret the day that you became part of an administration. Right now as we speak, all the heavyweights of the Patriotic Front have left Mr Lungu. President Chiluba when he started talking about the third term, both his vice presidents, all his 21 ministers left president Chiluba. People don’t want to continue serving in a certain way,” he said. Meanwhile, Mumba said that all those who misappropriated MMD funds would be individually charged soon after the court case was disposed off. “I want to clarify to the Zambians that there are no two MMDs. Once the case is through in the courts, we are going to securely take over all those facilities and they are going to have to pay a very high price for the mismanagement of resources and the vehicles of the Movement for Multi-party Democracy in the time they have been purporting to be in leadership. And they are going to be individually charged with criminal offences after the court case. Fidgeting with the names of the leadership of the MMD at the Registrar of Societies, that will be a separate criminal charge,” said Mumba.